Terry Pitts of Vertigo recently highlighted a number of events being held in North Carolina, London and Berlin to mark the tenth anniversary of the death of W.G. Sebald, who was killed in a car crash ten years ago already, on 14 December 2001. Another event can now be added to this list, as can be seen from this ad I came across recently for a similar event, which is to be held at the Kaaitheater in Brussels on 14 December. Presented as a musical-theatrical homage to W.G. 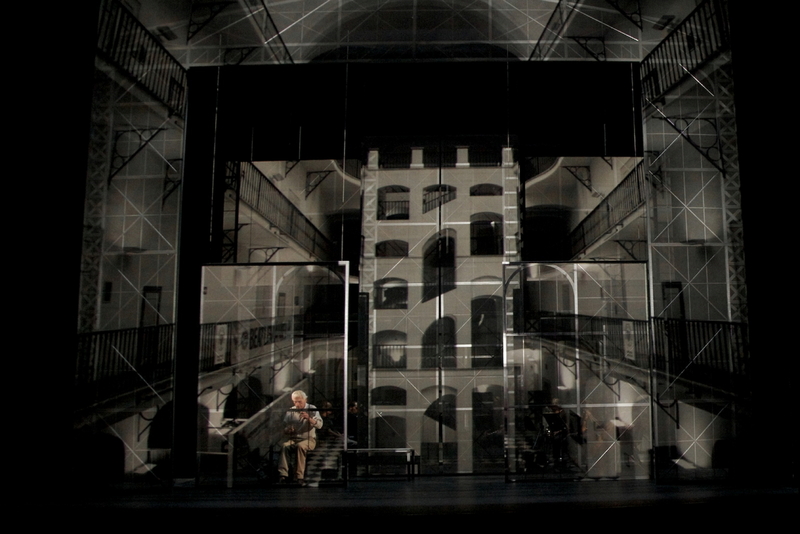 Sebald, Austerlitz is a collaboration between the composer Jérôme Combier, the video-maker and scenographer Pierre Nouvel, and the contemporary music ensemble Ictus. 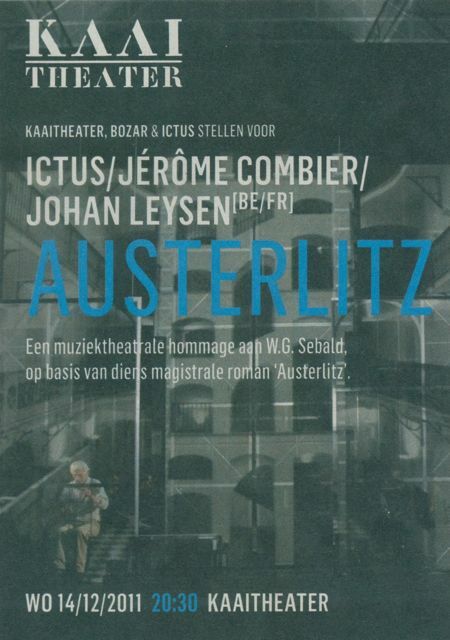 Performed in French by the Flemish actor Johan Leysen, Austerlitz was commissioned by the Festival d’Aix-en-Provence and the Ictus Ensemble. It premiered on 19 July already at the Théâtre du Jeu de Paume in Aix-en-Provence, and was also performed on 18 and 19 November at the Opéra de Lille. The above picture is taken from the Kaaitheater website, which also features a short three-minute clip of the show: the clip already gives an idea of the overlapping of music, images and voices used to convey the layers of history and memory Jacques Austerlitz has to sift through during his (mental and physical) travels through Europe. I’m not a big fan of the novel and I’m not sure I’ll be going to see the performance, but it is interesting to see that Sebald’s work is still inspiring artists from a range of disciplines. More information on this performance is also available on the Ictus Ensemble website (in English) and blog (in French). This entry was posted in Brussels, W.G. Sebald and tagged Austerlitz, Ictus Ensemble, Jérôme Combier, Kaaitheater, Pierre Nouvel, Sebald. Bookmark the permalink.